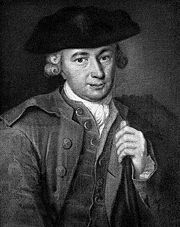 Johann Georg Hamann (August 27, 1730 – June 21, 1788), also known by the epithet Magus of the North, was a philosopher of the German Enlightenment. He was a fideist, Pietist, and a friend and intellectual opponent of the philosopher Immanuel Kant. He was also a musician-lutenist, having studied this instrument with Timofey Belogradsky, a Ukrainian virtuoso then living in Königsberg. After suffering some personal difficulties early in his career, he read the Bible and experienced a religious conversion. His distrust of reason and the Enlightenment led him to conclude that faith in God was the only solution to the vexing problems of philosophy. Hamann never held any academic or ecclesiastical post, but his many short articles, written in response to particular events or to the publications of others, inspired thinkers such as Friedrich Heinrich Jacobi, Johann Gottfried Herder, Hegel, Goethe, and Kierkegaard. He was one of the precipitating forces for the counter-enlightenment. Hamann’s thought had an enormous impact on the literary movement known as the Sturm und Drang ("storm and stress"), whose works emphasized nature and human passion. Hamann was also instrumental in the rise of the Romantic Movement in Germany. Johann Georg Hamann was born in Königsberg, Germany, on August 27, 1730, the son of a midwife and a barber-surgeon. He began to study philosophy and theology at the age of sixteen, and later changed to law, but mainly read literature, philology, rhetoric, mathematics and science. He never graduated from university, but left before completing his studies and became governor to a wealthy family on a Baltic estate, continuing in private his broad reading and research. He accepted a job in the family firm of a friend from his Königsberg days, Christoph Berens, and was sent on a mission to London, in which he evidently failed. He then enjoyed a self-indulgent life until he ran out of friends, money and support. Depressed and impoverished, living in a garrett, he read the Bible from cover to cover and experienced a religious conversion. Hamann returned to the House of Berens in Riga, where he was apparently forgiven for his failure in London, and fell in love with Christoph Berens' sister, Katharina. He asked to marry her but was denied permission by Berens, who was a follower of the Enlightenment and did not understand Hamann's new-found religiosity. Discouraged, Hamann returned to his father's house in Königsberg, where he lived until the final months of his life. Hamann suffered from a pronounced speech impediment and this may have been why he he never held an official academic post, nor an ecclesiastical one in Königsberg. Eventually, through the intercession of his acquaintance, Immanuel Kant, he was given employment as a low-level civil servant in the tax office of Frederick the Great. His principal activity was as an editor and a writer. He was fluent in many languages and was considered one of the most widely-read scholars of his time. In spite of his commitment to Christianity, he lived with a woman whom he never married but to whom he remained devoted and faithful. He doted on their four children, and occasionally mentioned them in his writings, usually as distractions to their father’s concentration. Hamann was also a musician-lutenist, having studied this instrument with Timofey Belogradsky, a Ukrainian virtuoso then living in Königsberg. Near the end of his life, Hamann accepted an invitation to Münster from one of his admirers, Princess Gallitzin. He died there June 21, 1788. Hamann was strongly influenced by the writings of David Hume. He defended his rejection of the Enlightenment by the publication in 1759 of Sokratische Denkwürdigkeiten (Socratic Memorabilia), and the following year of a collection of essays including Aesthetica in Nuce. In Sokratische Denkwürdigkeiten Hamann aimed to defend religious faith from rational attack without in any way accepting the rationalist’s terms of debate, and to reconcile Christianity with philosophy. Hamann regarded truth as a necessary union of reason, faith, and experience. He criticized the Enlightenment’s dependence on reason by holding up the example of Socrates, who often claimed not to know anything, and proposed that genius, rather than reason, allowed Socrates to know the truth. Aesthetica in nuce attacked Enlightenment ideas on art and beauty. Hamann criticized Enlightenment attempts to reduce beauty in art to a set of rules for accurately imitating nature, and to define art as a response to the subjective human capacity for feeling and sensation. Hamann’s early writings inspired thinkers such as Friedrich Heinrich Jacobi, who argued that reason is based entirely on faith, and Johann Gottfried Herder, who developed a theory of human thought based on the continuous historical development of humanity from its original natural state. Known by the epithet Magus of the North, he was one of the precipitating forces for the counter-enlightenment. Hamann’s thought had an enormous impact on the literary movement known as Sturm und Drang ("storm and stress"), whose works emphasized nature and human passion. Hamann was also instrumental in the rise of the Romantic Movement in Germany. Hegel and Goethe called him the “brightest head” of his time, and he was a major influence on Kierkegaard. Hans Urs von Balthasar devoted a monograph to Hamann in his volume, Studies in Theological Styles: Lay Styles (Volume III in the English language translation of The Glory of the Lord series). Hamann also influenced twentieth century German thinkers, particularly those interested in language. In the last few decades there has been renewed interest in Hamann amongst philosophers, theologians, and German studies scholars around the world. Immanuel Kant was Hamann's personal friend but a philosophical opponent. In 1781 Kant published Critique of Pure Reason, the most important event in German philosophy during the eighteenth century. Hamann agreed with Kant’s proposition that reason is incapable of attaining knowledge of the existence of God and the immortality of the soul; and that these beliefs are also incapable of being refuted through reason. Hamann believed that Kant was replacing religious faith and cultural tradition with reason. He responded by writing a short essay entitled "Metakritik über den Purismum der Vernunft" ("Metacritique on the Purism of Reason"), which was never published in Hamann’s lifetime. Hamann included it in a letter to his friend Johann Gottfried Herder (also a student of Kant’s), and Herder passed it on to Friedrich Heinrich Jacobi, exerting what one commentator has called a "subterranean influence" on German thought after Kant. Language was one of Hamann's philosophical preoccupations. From the beginning of his work, Hamann gave precedence to expression and communication, passion and symbol over the language of abstraction, analysis and logic. In the Aesthetica in nuce, Hamann claimed that the world is "a speech through creation to creation," implying that language was not created by human reason, but was endowed on objects by God the creator. Hamann sometimes maintained that language was the simultaneous work of both God and humans; in other writings he implied that God alone was the source of language. Hamann believed that neither thought nor reason was possible independently of language, which made reason dependent on God. Lowrie, Walter. Johann Georg Hamann, An existentialist (Princeton pamphlets). Princeton Theological Seminary, 1950. History of "Johann Georg Hamann"
This page was last modified on 10 May 2018, at 19:14.